My daughter Jennifer and I attended the opening of the new exhibition of Korean art at the Philadelphia Museum of Art over the weekend. This offers a large and quite wonderful collection of all sort of objects produced in Korea during the Joseon Dynasty (1392-1910). The exhibition continues until May 26. For anyone interested in a family outing that is both educational and just plain fun, this is the place to go. 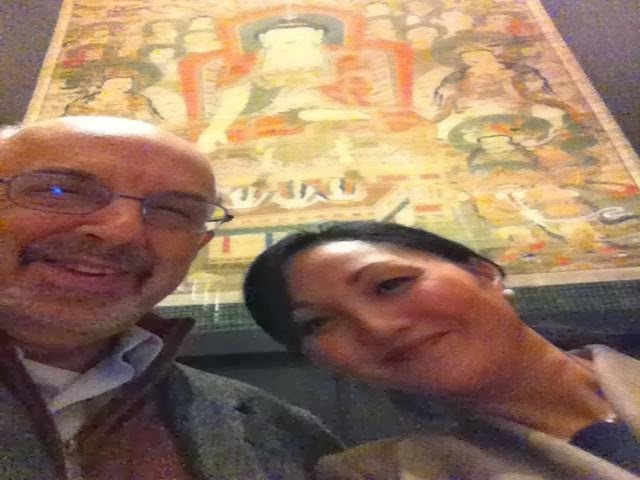 Jennifer took this photo of us standing in front of an enormous 17th century tapestry now hanging in the museum's Great Hall; it has never before traveled outside Korea. I am an adoptee of Korea from back in 1980, the orphanage changed my name because I was from North Korea, and am one of the sons of the late Kim Jung Ill. Obviously your agency a nd that orphanage thought they had real good reasons to lie to the family. Only one problem when your adopted at 5 yrs old you don't forget about what you saw and experienced those 5 years. I remember the conditions and the violence as a toddler, and remember being transported across the border, being in that orphanage and them telling me what my new name is because I realize full well now, that they knew I was one of the North Korean leader's son. Of course who ever was in charge of my adoption knew about all this and lied to the family that adopted me. The majority of the general population don't think about the contrast among suit and tuxedo but you can get bestessay testimonials for best work. Thgis site is so useful like individuals can without much of a stretch look about their stuff and called them in various way. A decent post to peruse. such an accommodating post.